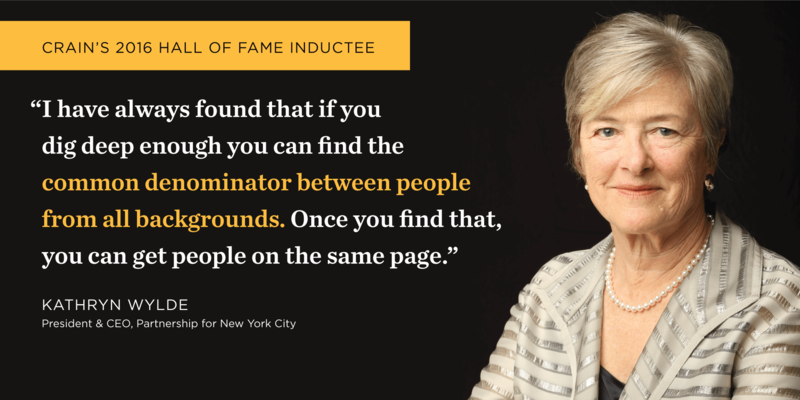 Kathryn Wylde, President and CEO of the Partnership for New York City, has been inducted into Crain’s 2016 Hall of Fame, an award bestowed on business leaders who have positively impacted the city through their work and civic and philanthropic activities. Wylde has been honored alongside an esteemed group of business leaders including Ken Langone, Invemed Associates; Geoffrey Canada, Harlem’s Children Zone; Stephen Berger, Odyssey Investment Partners; and Bruce Ratner, Forest City Ratner Cos. The inductees were featured in this week’s Crain’s New York Business, and discussed their careers, successes and legacies. The full article is available on Crain’s.